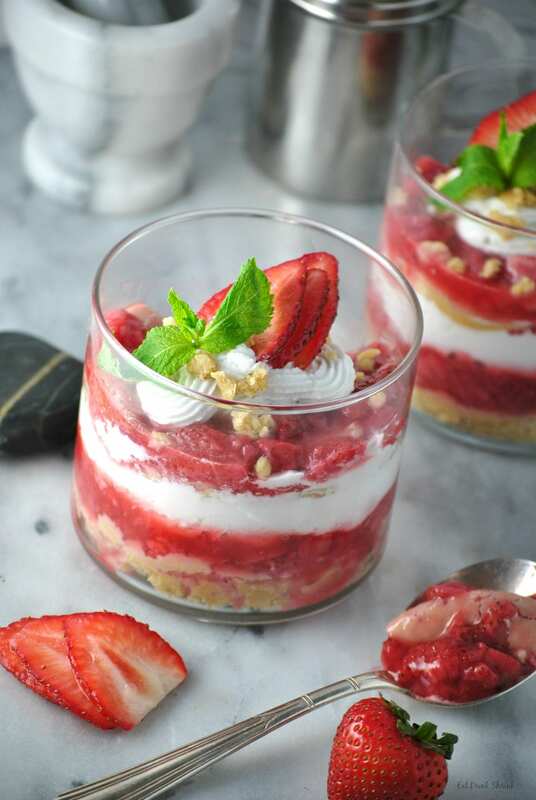 Vegan Strawberry Shortcake Trifle - Eat. Drink. Shrink. For the record, I love fresh strawberries in the summer! They are in season, which means they pack optimal flavor, can be more sustainable, and you can buy them by the buckets for half the price! 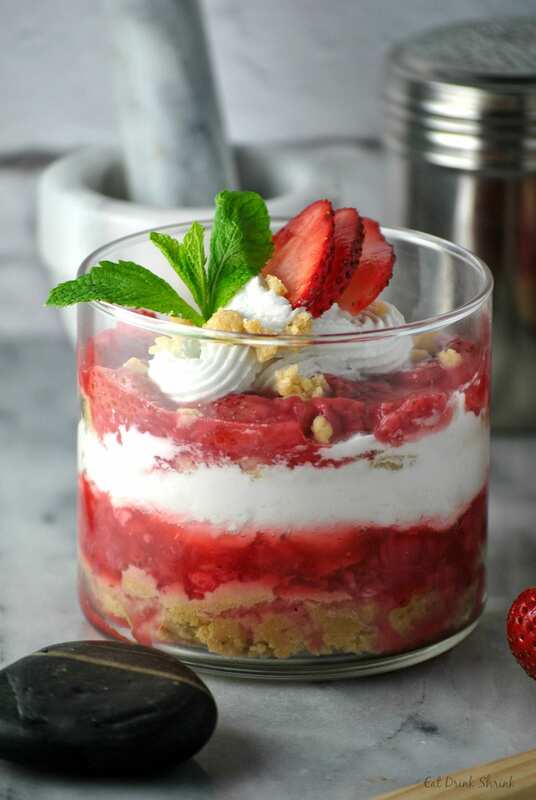 While some strawberry shortcakes can be more biscuit like, this recipe offers more of a cake like texture, which I prefer! This recipe was inspired by the weather shifting (thank goodness), my love for light effortless desserts, coconut whip, and desserts that are esthetically pleasing! You can make this dessert in a full size dish or make individual servings like I did for a more personalized touch! To make the strawberry sauce, wash and slice strawberries, throw in a pan on medium heat. Combine the lemon juice with arrowroot until dissolved. 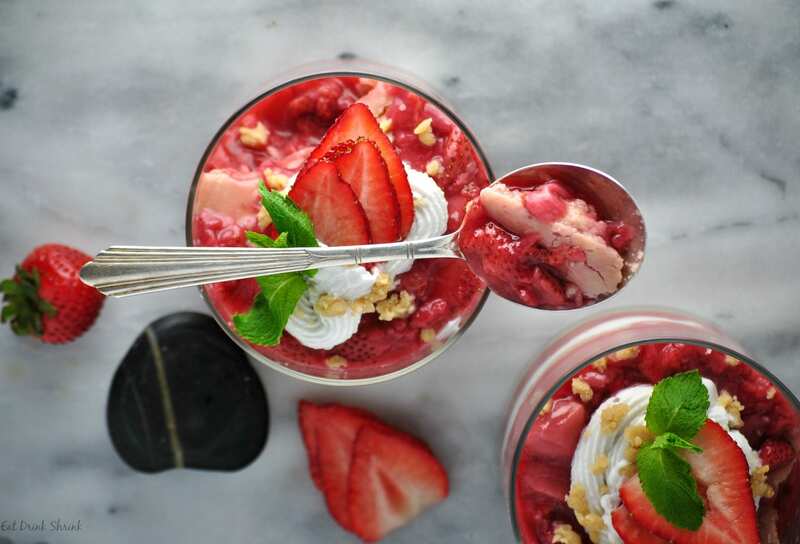 After the strawberries start to soften, add the arrowroot mixture and coconut sugar and cook for 5-7 minutes until it starts to thicken. While that cooks make the strawberry whip! To make whipped coconut cream. Open refrigerated can and remove only coconut cream. Strain off all coconut water and save for another use. Place coconut cream and powdered sugar into large bowl of standing mixer. Whip on high for 3-5 minutes, until light and fluffy. Add vanilla. Whip until combined. Once whipped coconut cream is ready, immediately assemble cake. 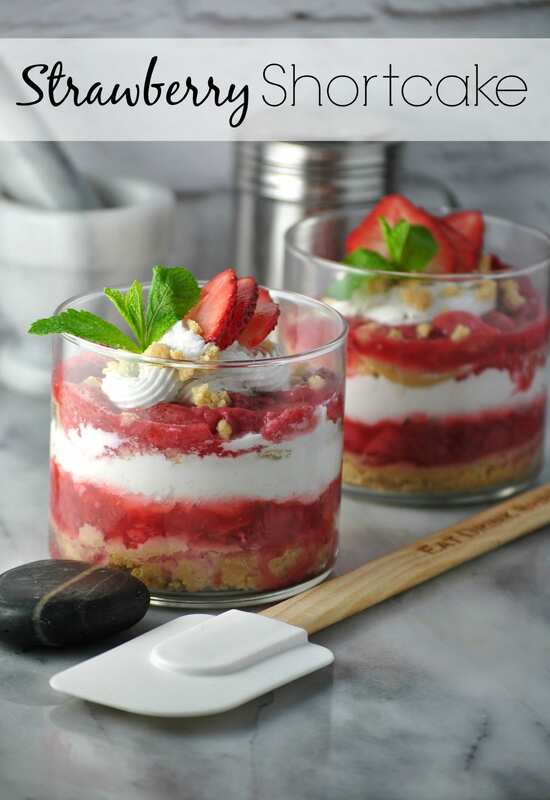 Place one layer on cake stand/serving plate and top with an even layer of strawberries. 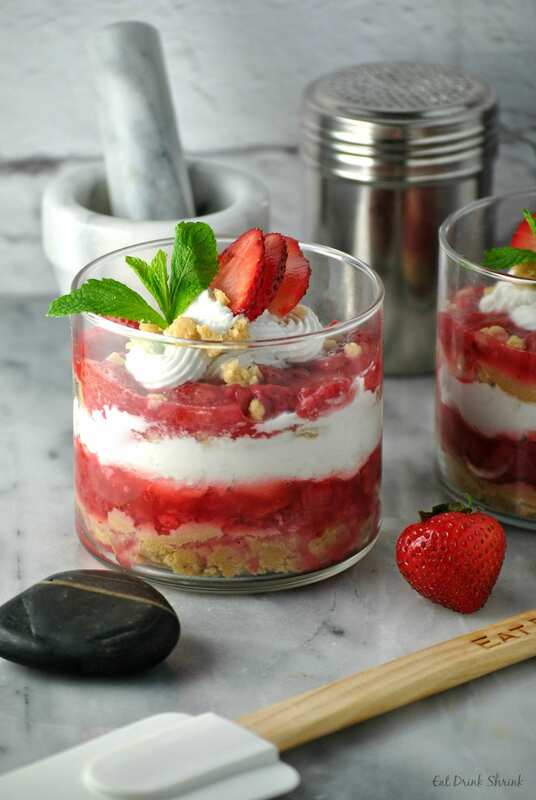 Carefully spread 1/3 of whipped coconut cream on top of strawberries until even. Top with second cake layer, even layer of strawberries and 1/3 whipped coconut cream. Top with final cake layer and spread remaining strawberries, then whipped coconut cream evenly over top. 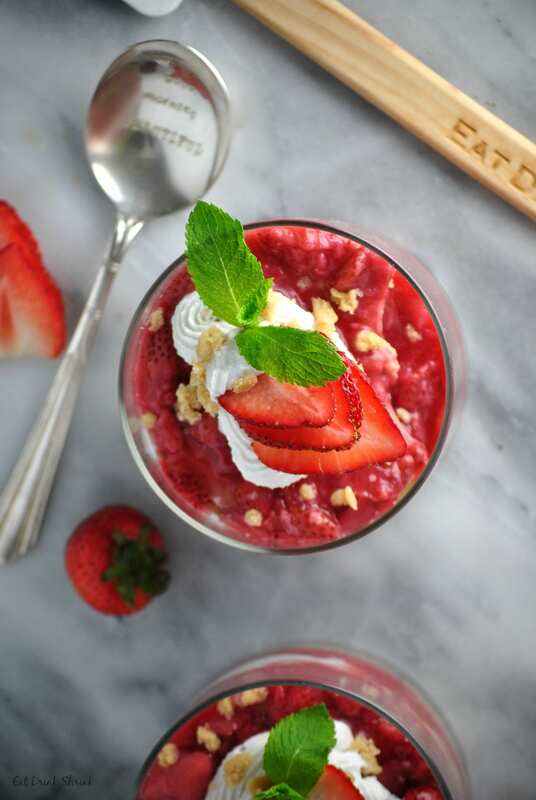 Garnish with a few whole strawberries, mint, coco whip and crumbles from cake scraps. Serve immediately or chill in refrigerator. Serve same day.